Americans living in a democracy tend to turn away from other countries and their ways of life. While news channels don’t show the real truths of other countries, naturally, assumptions start of the secrets within those borders. With assumptions comes misconceptions, which lead to many false accusations about foreign governments and ways of living. Misconceptions, due to the American government suppressing the news about third world countries, includes sugar coating these issues, or not reporting on them at all. Americans should not assume the worst of other countries governments and people without undergoing real life experience. Early 2018, my parents told me that we will be going to Cuba for Thanksgiving to celebrate my abuela’s (grandmas) birthday. At first, I was confused … why Cuba? Watching the news, I heard that the country had a communist government, and that their people were completely controlled by one ruler. I also heard the natives, colloquially referred to as “Cubanos”, were impoverished and technologically deprived. Hearing this, I automatically assumed this meant the country was unsafe. I did some research and found little information on their situation. It seemed as if the articles were only blogs– no national news companies were reporting on them. All these blogs explained how amazing their experiences were–and how beautiful the island and people were. Knowing Cuba is poor and needs help, why aren’t American news stations giving them proper coverage to help attract tourists? Concerned, I asked my abuela— why are we going to Cuba? Experiencing a communist country first hand, I learned the real truths, along with a deep gratefulness of my life as an American citizen. Before leaving for Cuba, I heard all kinds of messages such as ¨Be careful!¨ and ¨Don’t get kidnapped!¨. Upon arrival to the country 90 miles off of Key West Florida, I was culture shocked. The Cuban people are the most hospitable, beautiful, and hard-working people I have ever met. Some were noticeably struggling more than others, but their resiliency, strength, and joyful, optimistic, appreciative souls were transparent and communal. We met many people who had nothing, but still did everything to make us feel welcome. Showing us around, offering to give us tours, and just welcoming us with open arms. I felt safer there, more than anywhere else, late at night. When we first arrived, we found a restaurant to eat at. We sat and were given menus; the waitress told us that they only had four dishes available. We quickly came to realize that almost all the restaurants had that problem. Since the government controlled their food supply, it had been a slow week for businesses as they weren’t receiving enough food. The waitress sincerely apologized over and over, and even gave us extra food on the side. A few minutes into lunch, a poor woman in torn clothes approached us with a packet of sazón (a type of seasoning). “Por favor mi amor, estoy usando esto para alimentar a mis hijos pero necesito un poco más,” she said. She was begging for one American dollar to feed her kids. She had that one packet of seasoning, but needed a little more to fulfill her family. One American dollar to her meant so much more than 20 Cuban pesos. She was beyond grateful and felt she could do anything with that one American dollar. To us that is nothing, but to her she could finally feed her whole family. The car he was driving was not his. Mostly all of the tour guides with these cars do not own them, since they can’t afford them. They belong to a rich man from Miami, who gets mostly all the profits from the tours. The guides must make a certain amount of money a week to keep a certain (low) percent. All the prices on these tours are negotiable too, so most people pay very little. Sometimes, these tour guides will get scammed into receiving no money from their tours and have to send it all to Miami. He stays with this job because he is desperate for money to provide for his family. Walking around the streets, we noticed a group of men boxing each other on the streets. Since it is so hard to leave Cuba, these men are looking for any way to get out. Practicing in the blazing sun to become a professional boxer is one way to leave and make it big. The chances are slim to none, but these people are desperate and willing to try anything. Other poor Spanish countries are known to do this too– in the Dominican republic some kids leave school at a young age to practice baseball and become a professional. Since Cuba takes their education seriously, kids cannot leave school so they must practice after they’re graduated. While sightseeing, we also witnessed many people set up stands to sell authentic clothes and wooden decor. Just making eye contact with these people will have them begging you to buy their items. All of the prices for these items were negotiable, as their grateful for just about any amount of money. Compared to the rest of countries the literacy rate in Cuba is very high. Their education is free so almost everyone goes to college after high school; except all men must serve in the military at 17. I witnessed the outcome of this education firsthand. 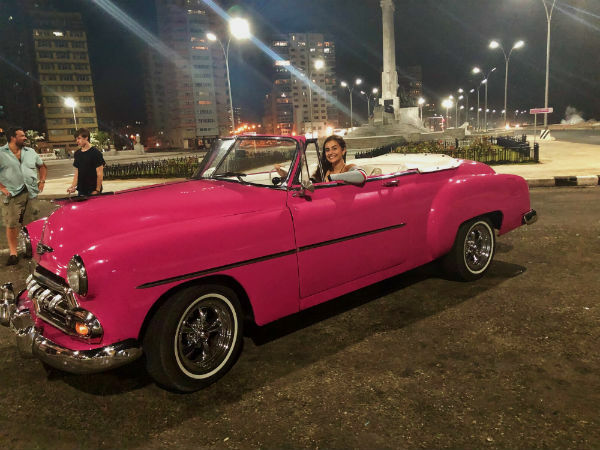 On an educational tour around the city of Havana, our guide, who has never left Cuba, and graduated from the University of Havana, was able to speak four different languages. Her English and her awareness of American culture was impressive. She mentioned things like Central Park and Fifth Ave– things that we thought were shielded from the people. Her biggest goal was to leave the country just to see what else is out there. She explained how difficult it was to leave, saying the visa process could take up to years if you get approved– which is highly unlikely. The only way to leave Cuba to go to Spain (which is the most popular place to go) was if you had an ancestor from there. You had to prove if you had one, even if they were from hundreds of years ago. This long process is what makes Cubans stay, because they don’t want to go through it all. A government-dominated country like Cuba does not have the same freedom rights as we do in America. While they may be strictly controlled, the country is highly educated, immensely safe, and overall possess very gentle and humble residents. To assume and infer that this island is nonetheless exceptional, is why they are not receiving enough help. The Cuban people are beyond thankful for tourists, as they help bring in money to the country. Visiting a struggling country can help them more than you know.